We hope that the players were training in Zao Bodaira Athlete Village play an active part.We also supported by the best. 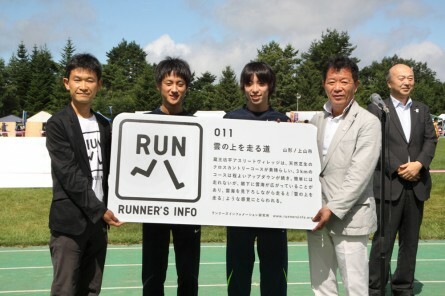 Zao’s cross-country course has been certified as a “A Track Above the Clouds” In opening ceremony of the Zao Bow flat cross-country tournament of the August 5, certified signboard has been awarded. We received a thank you video from HITACHI’s Softball team. It is a nice video of athletes practice scenes and publicity of Kaminoyama!